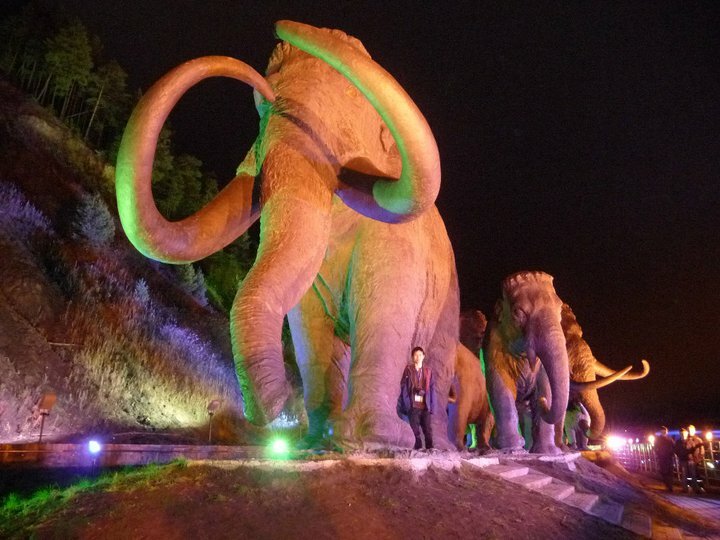 Almost like home, but these woolly mammoths are bigger than the Thai elephants! Today I got rested, simply because our boys had a chance to win against the South African, whose players seemed to be at the same level as ours. In my humble opinion, they were a little bit stronger than us. I didn’t go to watch the games today because I wanted to take my mind off chess for a while and do something else. I ended up taking a 15-minute-walk trip wading through cold weather to the nearest mall. To my surprise, many Russians, mostly girls, wanted to take some photos with me. I supposed they were so excited to have hosted this Olympiad. Or it could be that this city was too remote, and, likewise, not many foreigners came to pay them a visit. After having got what I needed, I walked back to watch the games via the Internet at our hotel. I followed both the official web site and ThaiBG.com, for the latter I had an opportunity to chat with some Thais. Hours passed, in the end, Thai Men’s Team won by 3.5/0.5. Actually, it could have been 4-0, had Jirapak not made a blunder. The Girls lost to the more superior Dominican Republic Team by 0-4. Today was a rest day. I, Jirapak, Wisuwat, Atippat, and Uaychai decided to take a stroll in the cold afternoon. We walked to the city’s church on the hill. It was a long walk and it was not until 4.00 PM that we got back to the hotel. We were all so exhausted. We then joined the rest of the teams on a bus to visit the Mammoth Museum. Here, we learnt a lot more about this city. After dinner at the hotel, we continued our tour to watch some sort of a Russian Musical Show. My head hit the pillow at 11.00 PM. I got rested again today. We were paired to entertain the UAE. They were again another team that was more or less in the same level as ours. Still, the results were quite unsatisfactory. For no apparent reasons, my teammates played below standards of their own. Jirapak threw away a knight. Atippat lost a pawn at the very beginning of the game. As such, we were defeated 1-3. The Girls met Barbados. Today’s game was quite important for Chanida, as she had lost for five consecutive games. She badly needed a win to boost her morale. To everyone’s relief, she did pull it off nicely. It was her first point at the Olympiad. As a result, the Girls Team drew with moderate Barbados 2-2. I was assigned to play today, because Uaychai wanted to take some rest. Time and time again luck was not on our side. We were pitted against very strong Switzerland Team – the strongest team with equal points to us. My opponent sacrificed his knight for a pawn but was rewarded with the upper hand throughout the game. Wisuwat again chose a daring path by deciding not to castle. It didn’t work out well for him and he eventually got crushed. Only Jirapak made amends for himself and got some consolation for the team by getting a draw against his GM opponent. Alas, the Men’s Team was defeated 0.5-3.5. The Girls played against a relatively young South Korean Team. I felt pity for them as they could have won it, but ended up losing by 1.5-2.5. The manager put my name on the players’ list again today against Algeria. My opening was good enough to give me an advantage. I tried pretty hard to find a winning combination, so much so that I wasted my brain too much, and, in the process, made some stupid mistakes and lost. What a pity! The Team therefore could manage only a draw of 2-2. The Girls played against the not-so-strong Kenyan Team but also got a 2-2 draw. The only good news of the day was that Chanida now got a hat-trick, winning 3 games in a row! Wisuwat wanted to take a day off. So, I replaced him. We again somehow were paired to meet the strongest team of equal points. 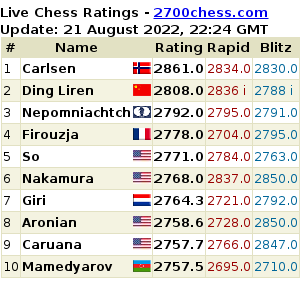 My opponent’s rating was 2352! I had a hunch that this was going to be my last game at this Olympiad. The last two rounds were too important as we needed to earn more points to climb up the table. I was therefore very determined to win this game. My opening was OK actually. Later, I got the upper hand by +3 and one of my pawns was queening [after the game analysis by Fritz, I was +14 at one stage]! I somehow made 3-4 consecutive blunders, and, not surprisingly, my advantage came down to only +4 and later to 0.0. My series of bad moves continued however, and, at this point, it was mate in 4. I felt ashamed of myself, so much so that I nearly cried. It was definitely a good experience for me. My loss made the Team suffer as we were beaten 1-3. The Girls drew with Libya 2-2. Chanida won again. It was 4-in-row for her!! Today was the 10th Round. 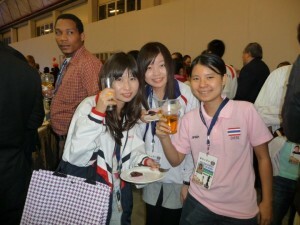 I went to cheer Thai Teams at the Playing Hall. The Men were to play Hong Kong, who were not so strong. One of them, Bryan, used to play in our BCC Open at Cha Am and lost to Wisuwat in the final Round. The Girls played Malawi. At first, we expected a clean sweep of 8-0 for the Boys and the Girls. It was a pity that Jirapak somehow made a mistake and his opponent managed to get a draw, despite the fact that Jirapak had been far better for the most part of the game. In conclusion, it was 3.5-.5 for the Boys, and 4-0 for the Girls. Chanida won her game again today. This was her fifth straight win. In the evening, I went to the bar at our hotel to have some glasses of beer. There, I met the Taiwanese Team members, with GM Wang Hao of China (2725) joining us later. We all had some good laughs together before retiring to bed around midnight.